I think I have just recovered from an emotional day trip to the not the coast, our first return visit after many years. Our plans were to se for ourselves the ‘Dark Hedges’ one of the film location for The Game of Thrones (neither of us have seen the series or read the books) We have wanted to visit this area long before fame hit the location although dad reminded me that he used to cycle the road but didn’t stop to take photos, probably before TV had been invented! 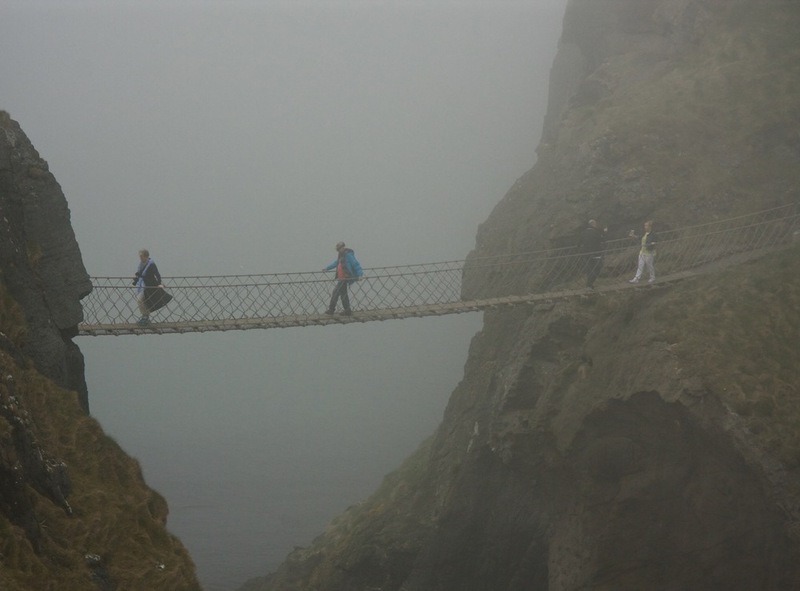 The sky was blue and the sun shining but this was soon to change as the next planned stop was Carrick-a-Rede to experience the rope bridge. I must admit I was a little nervous as I could remember the swaying feeling I had when I was there as a child. Maybe the sight which we were faced with was a good thing as I couldn’t see the full depth of what was actually below me. 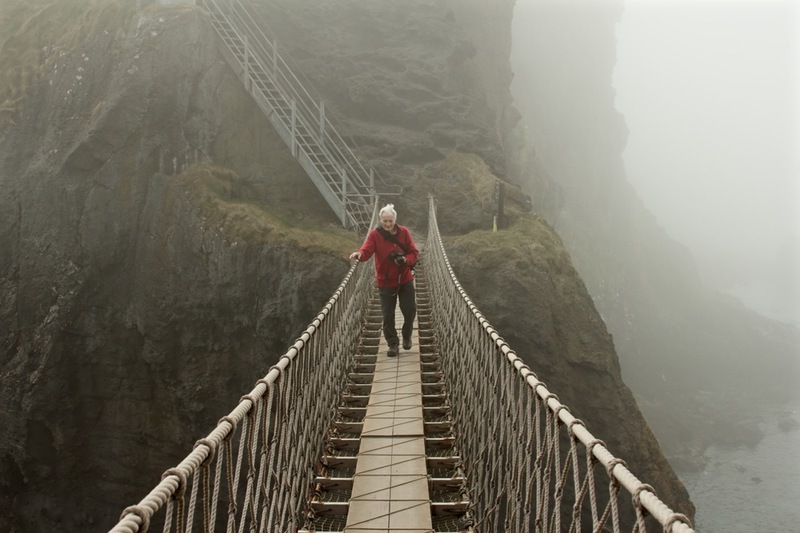 The rope bridge is suspended over a 30m-deep and 20m-wide chasm that was traditionally erected by salmon fishermen. 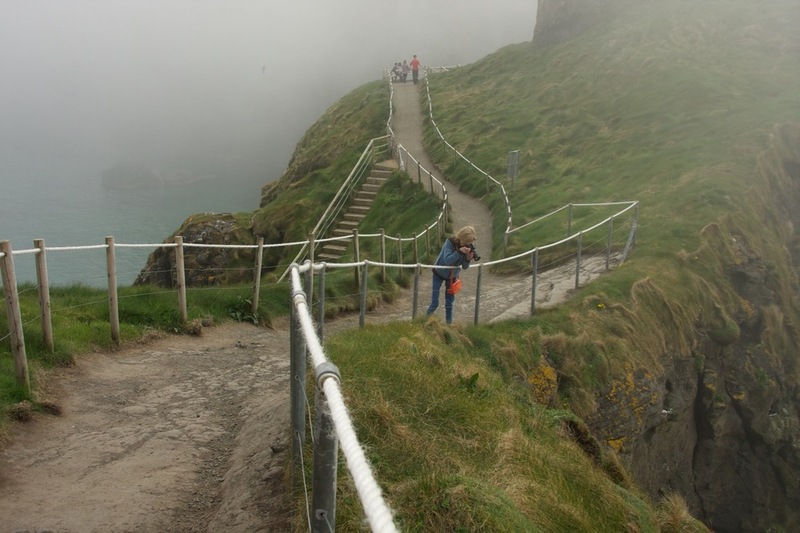 I am assure that those who are brave enough to cross over and experience the ‘swaying’ feeling in the middle are rewarded with fantastic views…….mist in our case although we heard and saw the sea birds clinging to the rocks below us. I can still hear the volume of their cries. We spent a little time on the other side before facing the return journey and remind ourselves we will have to go back to actually view the scenery which was hidden in the mist. We have never been in as thick a mist which chilled me to the bone. My hands suffered the most and I fear this is becoming debilitating for my photography. My fingers were pure white then black but I was determined I had to continue and pushed myself through the limits to try and capture some of the experience. We made the best of the situation and knew we could return later in the season but realised a lot of the other visitors were on holiday and this may have been the only time they had to visit the location, which completely shrouded in mist. There is a view point walk after the return crossing which we really would like to see and also make our way further on the coastal path which we had to admit defeat on and return to the car. I was disappointed in myself, I don’t know why when I couldn’t do anything about the mist but I seemed to think I was a failure as my photos wouldn’t be as I had imagined them. I also was annoyed that I wouldn’t be exercising in the same way as I thought I should be although perhaps this was for the best as exhaustion really loomed in front of me. 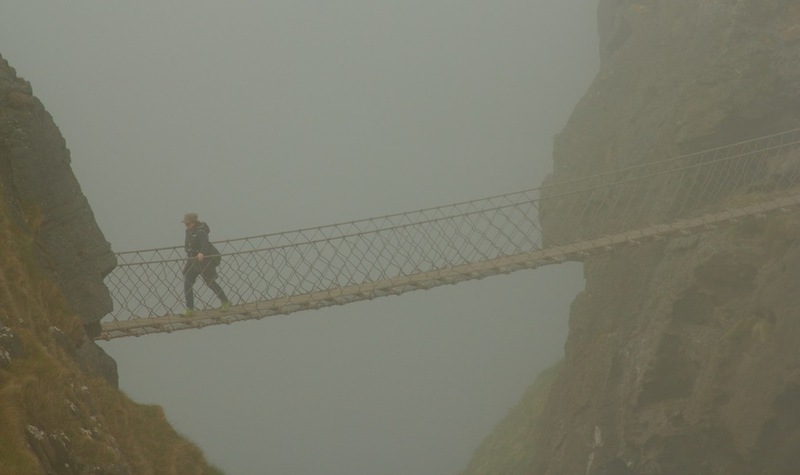 The sound of the gulls through the mist added a new dimension to the actual walk over the rope bridge. 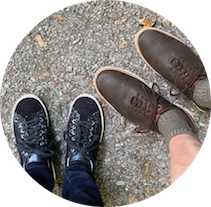 I know I came home exhausted and tearful but when I consider the quality time I had with dad and the discussions we had along the way. Dad had planned the scenic drive which was the same with mist. We opened our eyes wide when we saw blue sky as we headed a bit more inland but this was soon over taken with yet more mist. Thinking about our day as the sun is shinning right now we came to the conclusion that mist was better than pouring rain. The mist added atmosphere whilst there and I trust form our photos everyone will see just what we contended with while other parts of the country basked in sunshine with blue skies. We will return on the promise of better weather and compare the view we will see with the misty view we will never forget! I had a look at the hashtag on Instagram which made me smile as there were other photos of the incredible mist and mainly from tourists who may never see the splendour in clear weather. Perhaps I will sleep better tonight after the feelings of failure have subsided.